As if they are trying to completely quench Malawi’s thirst for high profile international musicians, Dru Hill, an American R and B, Soul and Hip Hop group from Baltimore is coming to Malawi for a show in Lilongwe slated for December 12. Dru Hill, which comprises Sisqo, Jazz, Nokio and Tao, is coming courtesy of Peermont Hotels, managers of Umodzi Park in the Capital City. They will perform at Umodzi Park’s Malawi Square which can accommodate more than 8000 people. Sisqo, real name, Mark Andres is popularly known for songs such as Thong Song which hit the airwaves in the 90s. Alongside other hit songs, it won the artist and the group world fame. Umodzi Park sales and marketing manager, Temwa Kanjadza, said the group brings in a better and exciting package. “We wanted a very competent package and Dru Hill just qualified because those who know Dru Hill will agree with me that the group knows how to dance on stage and they also sing well and that worked well with our intent,” she said. According to Kanjadza, local artists to curtain raise for Dru Hill include Skeffa Chimoto and Veejay Ice. Kadzanja said after the Lilongwe show, the group will perform at Emperors Palace in South Africa which is also managed by Peermont Hotels. 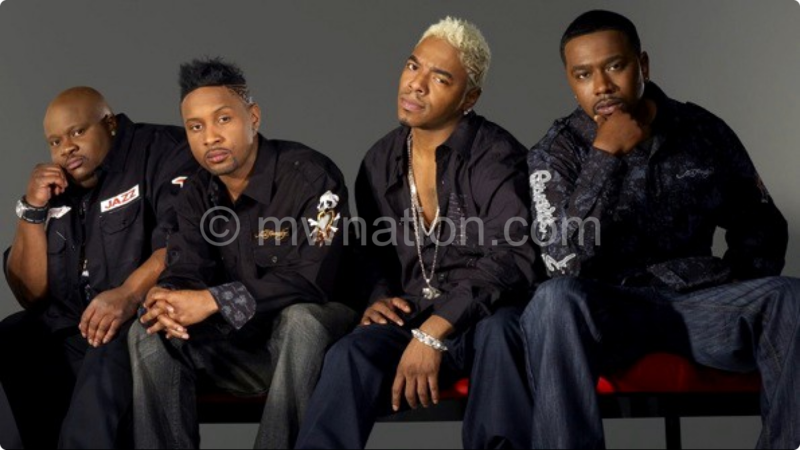 The coming in of Dru Hill adds to the many high profile international artists and bands that have performed or will perform in the country before the end of this year. Just last Saturday, music lovers enjoyed a rare performance from Jamaican dancehall artist Busy Signal at the Sand Music Festival; South Africa’s Lira and Uhuru headlined the Lake of Stars and Mingoli Jazz Festival respectively; P-Square has also been in the country. Remember, top Jamaican reggae band Morgan Heritage is also coming to Malawi before the end of the year. It surely cannot get any better than this.